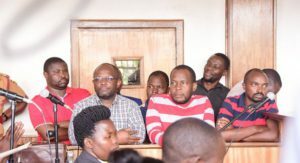 Red Pepper directors and editors appear before court recently. Courtesy photo. The African Centre for Media Excellence (ACME) has condemned the continued incarceration of the Red Pepper directors and editors, saying that the action is not justifiable. The five directors and three editors of the Red Pepper have been in detention since November 21. In a press statement released yesterday, ACME, a Kampala-based independent, non-profit professional organisation committed to promoting excellence in journalism and communication in Africa, also slammed the shutdown of the local tabloid and its affiliate radio station. The Red Pepper officials were last week charged with several counts of sedition, offensive communication and publishing information “prejudicial to national security” following the publication of a story in the newspaper’s November 20,2017 edition titled, “M7 plotting to overthrow Kagame – Rwanda”. “The prolonged detention of the eight and the closure of their business is not only disproportionate to the offences preferred, but also appears to be a calculated ploy to intimidate the Red Pepper and the entire media fraternity in Uganda,” said Dr Peter Mwesige, the ACME executive director. “These actions have a chilling effect on the exercise of the right to press freedom and the wider rights to freedom of expression and speech, which are guaranteed by the Constitution,” the statement added. Dr Mwesigye also criticized what he called the silence of a large section of Ugandans. “Those who are celebrating the silencing of Red Pepper should also remember that some of the offences preferred against the directors and editors, such as “offensive communication”, are as much a threat to ordinary Ugandans who are increasingly using computer-assisted communication,” Dr Mwesige further states. ACME remains a champion of excellence in journalism, and in particular supports the exercise of high journalistic standards that uphold accuracy, verification, fairness, and context. They, however, condemn the criminalisation of publication simply because the leaders or sections of society are not comfortable with the ideas disseminated or that their “peace” will be disturbed. “The state’s actions against Red Pepper are neither reasonable nor justifiable in a free and democratic society,” Dr Mwesige said. “We call upon Ugandan journalists, media owners, civil society actors, politicians and all those who believe in the freedom of speech to stand with Red Pepper even if some do not like how they do their journalism,” he added.